Welcome. 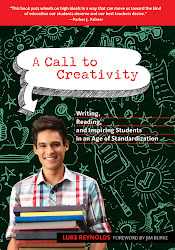 Here, you'll find all of the assignments mentioned in A Call to Creativity (Teachers College Press 2012), as well as a brief, three-minute video with some ideas on writing with an authentic voice. And here is a video on writing a Synthesis Essay! Here is the permanent link for the download of all assignments mentioned in the Appendix of A Call to Creativity. I hope these activities provide possibilities for your classes and that they inspire you and your students.